Ailsby Collection: Decoration for Defence Economy Leaders. This award took the form of an oval badge which measured 46 mm high and 35 mm wide. It had the outer edge with an indented inner line which measured 4 mm wide. The lower half of the oval was an open oak leaf wreath with two oak leaves with their stalks crossed. From these on either side are five bunches of three oak leaves. 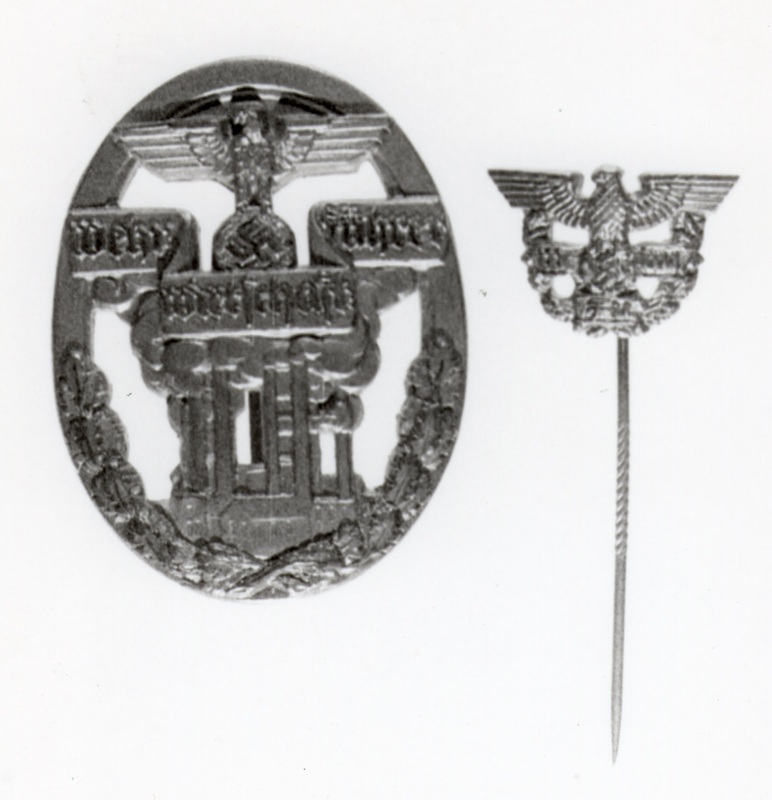 The badge at the top has the national emblem surmounting a banner in three folds bearing the inscription Wehr – Wirtschaft – Führer. Immediately below this is a factory complex belching smoke. The reverse is plain with a vertical hinge pin and hook. 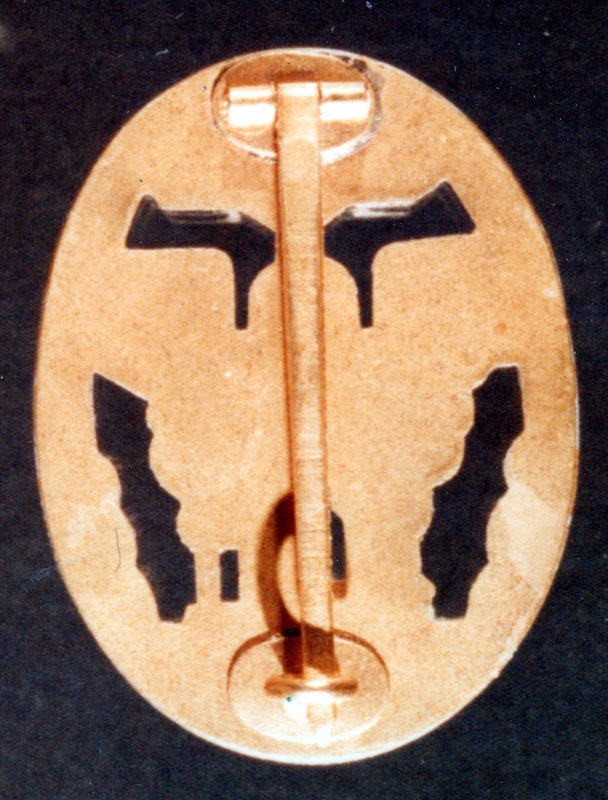 The hinge and hook are held to the badge by an oval plate. The badge was constructed from aluminium and was gilded with the leading edges of the Eagles wing and the inscription being burnished. The badge was manufactured by the Firm, C. E. Juncker of Berlin S.W.68. There is a second version that is of the same design, but measured 42 mm high and 33 mm wide. The reverse is plain with a vertical hinge pin and C shaped hook. The hinge and hook are held to the badge without an oval plate. The badge was constructed from tombak and was gilded with the leading edges of the Eagles wing and the inscription not being burnished. It was worn on the left breast. A miniature version, differering slightly from the full size badge was worn on the left lapel. A citation accompanied the bestowal of the badge. The full size badge and miniature version. On 31st January 1938, Goring set up a Council for Defence Economy. Its members were chosen from the leading industrialists in Germany. each member had the title “Defence Economy Leader”. The Council was charged with the responsibility of preparing and carrying out mobilization of the armenent industry and directing it in time of war. 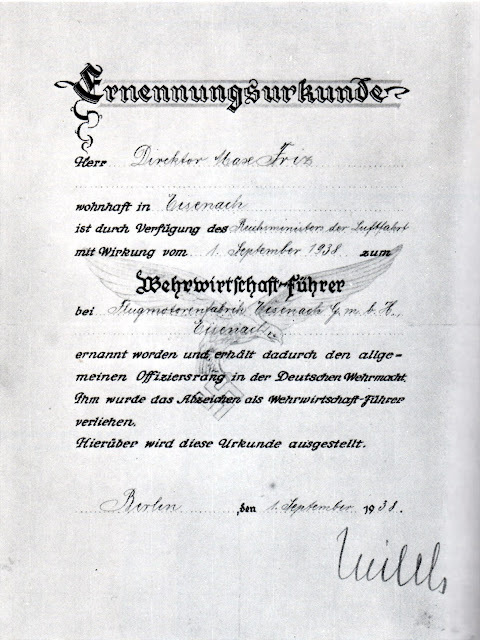 But before an industrialist could receive either the title or the badge, he had to submit a “declaration of political attitude” couched in the following terms, “I herewith declare I stand by the National Socialist concept of state without reservation and that I have not acted in any way against the interests of the people” proving this was a political as well as an industrial award. The golden badge for Defence Economy Leaders was instituted in March 1939 to recognise the members of the Council and to single out industrial leaders above middle management level who contributed significantly to the furtherance of industrial management. 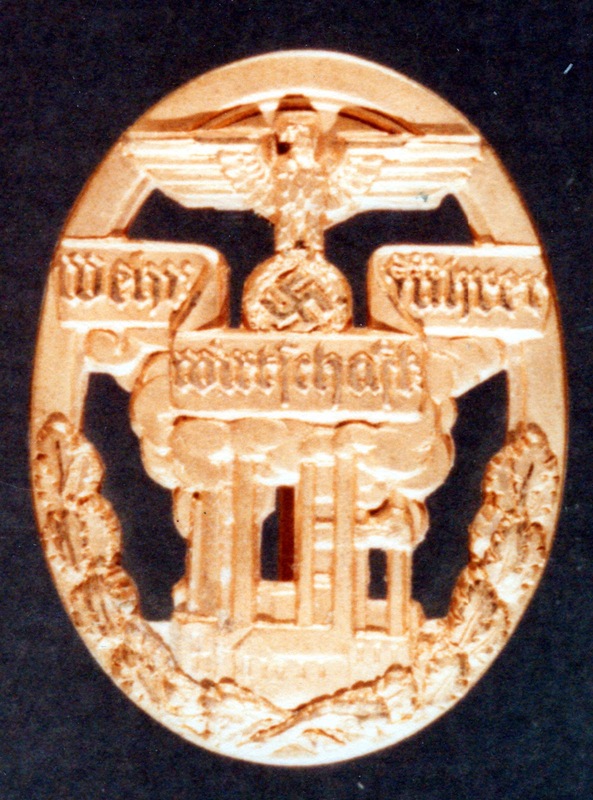 Recommendation for the award had to come from the Kreis in which the proposed recipient worked and had to be approved by the Oberkommando der Wehrmacht. A badge in wear at a conference in France mid war. 6 August 1892 - 26 April 1984 D.
1914 Iron Cross Second Class, 1914 Iron Cross First Class, Cross of Honour 1914-18 Combatants, 1914 Wound Badge Black Class, Knight’s Cross of the War Merit Cross with Swords 27 November 1944 (23 September 1944), 1939 Iron Cross Second Class bar, 1939 Iron Cross First Class bar, War Merit Cross Second Class with Swords, War Merit Cross First Class with Swords, Decoration for Defence Economy Leaders, SS Honour Ring, SS Honour Sword. I.G. Farben official, sentenced to 8 years' imprisonment at the I.G. 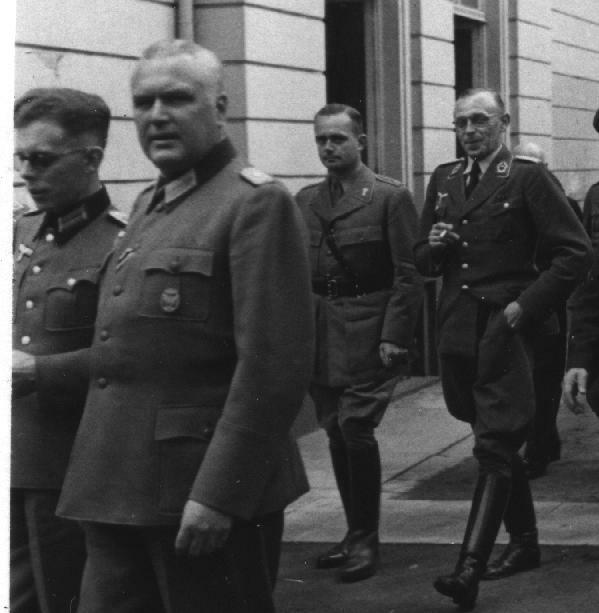 Farben Trial for involvement in slavery and mass murder, he was released in 1952. Associate of Flick, acquitted at the Flick trial. SS-Obersturmbannführer - I.G. Farben official, sentenced to 6 years' imprisonment for his involvement in slave labour and mass murder. He was released in January 1951. Industrialist, created the Dornier planes for the Luftwaffe. He was exonerated by a de-Nazification court. Head of several industries, sentenced to 7 years' imprisonment for involvement in slave labour, released in 1950. I.G. Farben official, acquitted at the I.G. Farben Trial. Designer and manufacturer of the He planes during World War II. He was classified as a "fellow traveller" by a de-Nazification court and fined, despite involvement in slave labour. Krupp official, sentenced to 10 years' imprisonment for involvement in slave labour, released at the same time as Krupp. I.G. Farben official, sentenced to 3 years' imprisonment for plunder and spoliation. He was released immediately, his sentence having been considered served. Official, sentenced to 10 years' imprisonment for involvement in slave labour, released at the same time as Krupp. Flick official, acquitted of all charges at the Flick trial. Chairman of the advisory board of I.G. Farben. Sentenced to 6 years' imprisonment for involvement in slave labour, released in 1950. Head of the Krupp industry until 1943, not tried due to ill health. NSFK-Standartenführer - Head of the Krupp industries, sentenced to 12 years' imprisonment for his involvement in slave labour. He was released on February 4, 1951. Krupp official was also involved in the July Plot. He avoided execution by faking partial amnesia, but was sentenced to 7 years' imprisonment for his involvement in slave labour. He was released in 1950. Friedrich, Dr.-Ing. e.h., Dr. phil. hc. Official of I.G. Farben, sentenced to 7 years' imprisonment for involvement in slave labour at Auschwitz, the only defendant convicted on charges of plunder, spoliation, mass murder, and slavery. Airplane designer and manufacturer, of the Messerschmitt planes. 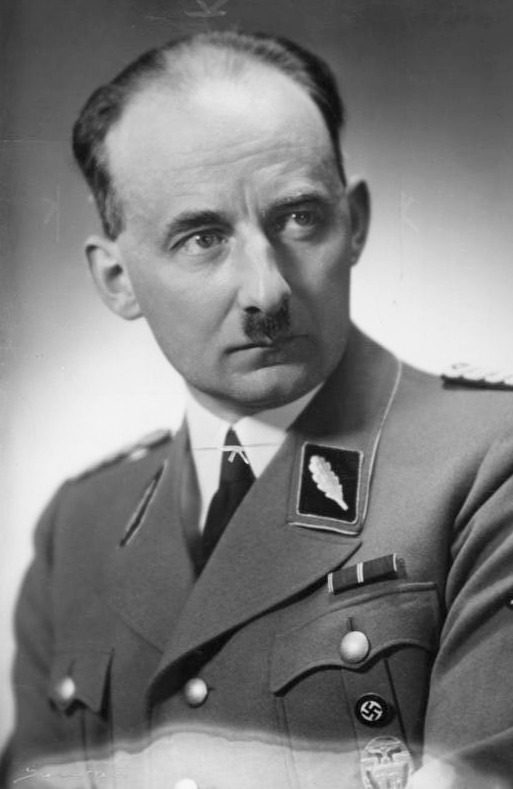 He was classified as a "fellow traveller" by a de-Nazification court and fined. Official at Krupp, sentenced to 12 years' imprisonment for slave labour. Released at the same time as Krupp. Official at Krupp, only defendant at the Krupp trial to be acquitted of all charges. Hermann, Dr.-Ing. Dr. rer. pol. hc. I.G. Farben official, sentenced to 4 years' imprisonment for plunder and spoliation. I.G. Farben official acquitted of all charges ath the I.G. Farben trial. SA-Hauptsturmführer - Official of I.G. Farben, sentenced to 5 years' imprisonment for involvement in plunder and spoliation. SS-Brigadeführer - in addition to being deputy to Friedrich Flick, was a captain in the navy. He was sentenced to 5 years' imprisonment for having membership in a criminal organization. He died in prison. The main aircraft factory production manager "Arado". Industrialist and Vice President of the Chamber of Economics in Berlin. He continued to be a successful industrialist after the war. It is very hard to know. Dose it come with document? Is there any other items with it? Again photos, in wear or other.